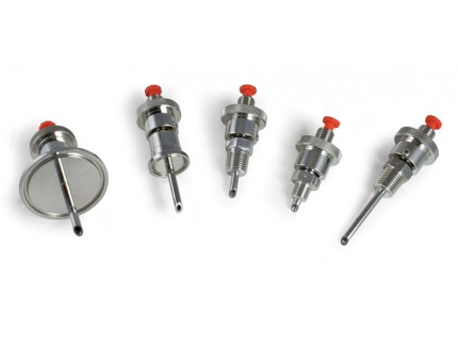 Kanomax FMT has designed a range of Universal Sample Valves (USV) for taking mid-stream, high-purity water samples with no risk of atmospheric contamination. The valves are available both NPT-threaded and sanitary connections. Secure Sampling. Use additional fittings with the USV to make secure sampling connections. Example: Use a Galtek® retaining nut and 1/4 inch diameter PFA® Teflon tubing to securely attach particle counters, Total Organic Carbon (TOC) monitors, Nonvolatile Residue Monitors (NRMs), and other water quality monitoring instruments. Grab Sampling. The simplest use of the USV is to take a “grab” sample in a sterile container. Simply flush the valve by opening it to its maximum setting and then allow a sample to flow to the container. Syringe Sampling. The USV’s syringe sampling feature provides a unique way of taking a sterile sample directly from the water stream. After installing and sanitizing the valve, a sterile hypodermic needle (attached to a 60 mL syringe) can be inserted through the precision-drilled septum, and a midstream sample removed. With this method no airborne bacteria can contaminate the sample. Monitoring Bacteria. The USV’s male Luer connection is designed to fit directly into the inlet port of standard bacteria culture monitors. Sanitize the USV before use then collect and analyze the bacteria sample. Open USVs are sanitized whenever a UPW system is sanitized. However, USVs used only intermittently should be sanitized before use. To sanitize a USV, inject either a paracetic acid/hydrogen peroxide solution or isopropyl alcohol into the valve with the syringe.